Paintless Dent Repair: door dings, hood dings and parking lot dents are extremely common. The Paintless Dent Repair (PDR) process removes hail dents or other types of damage from a vehicle’s exterior surface panels without disturbing the finish. Sometimes includes bonding a “tab” or other device to the exterior of the panel and pulling the dent from the topside. Actually, it’s incredible! 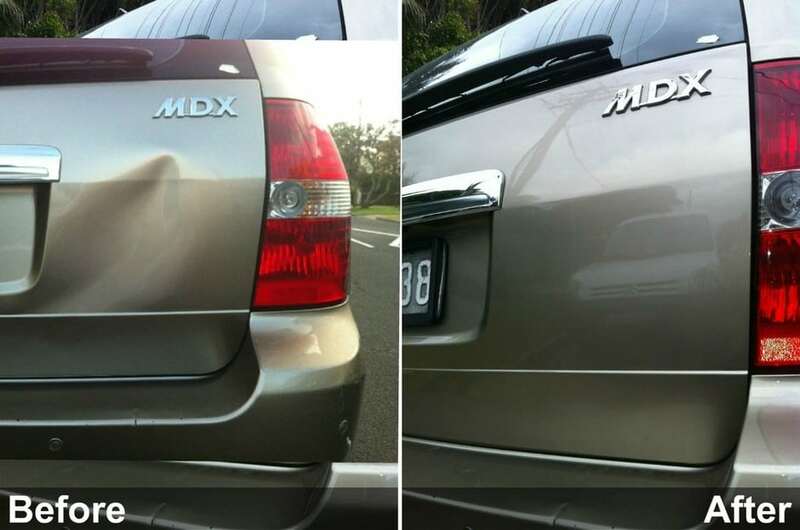 It works so well that in the majority of cases the dings and dents are completely removed. They’re invisible, gone, can’t-believe-your-eyes fixed. In the case of the long board to car damage, you need to get an estimate to fix the dent damage. The cost of the repair really depends on what and where the damage is. For instance, if the dent damage is on the hood and there is no paint damage or metal creasing, Paintless Dent Repair is an option and should not cost more than $150 – $300. Alternately, if the dent is in the area between the roof and the front passenger window (in the bend or curve), the cost to fix this damage will be considerably more. Once you know the real cost to fix the dent damage, you should find out what your insurance deductible is. If the dent damage cost to repair is higher than your deductible, you have the option to file a claim. Fortunately, there’s door ding insurance. For between $300 and $600 a year, you can get the ding repaired and not worry about it. But is it worth it? Do you need Paintless Dent Repair Auto Insurance? Should you get your dings fixed using PDR techniques? Yes. Whenever possible. Get your dings fixed via PDR, but don’t buy an insurance plan. Yes! Great Plains Auto Body will work with all insurance companies. Paintless Dent Repair is always the insurance company’s first choice for hail damage vehicles. All hail damage and any collision damage is covered under full coverage insurance policies. Minor dents and door dings may not be covered under your policy. Usually these types of damage are a per incident bases and a deductible may apply for each dent if they did not occur at the same time.